It’s been over 5 years since Wahoo’s first product, the Wahoo Fisica ANT+ adapter for the iPhone. That was later renamed to the Wahoo Fitness Key. Then came the BlueHR, a Bluetooth Smart heart rate strap. 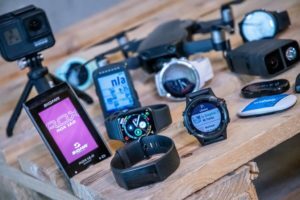 But their ‘breakout’ product was likely the Wahoo KICKR, the first dual ANT+/Bluetooth Smart trainer, and the first trainer to provide an open interface for any 3rd party app to develop against it. Now, all of those features are commonplace. 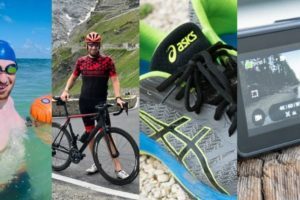 But silly as it may be, as any trainer user knows – one of most befuddling things about using a trainer for a long winter workout is where to stash various essentials. Extra water bottles for those multi-hour sessions, or a laptop to watch movies on. Or even just a safe place for your phone to be charging while riding in between tweets or Snapchat selfies. 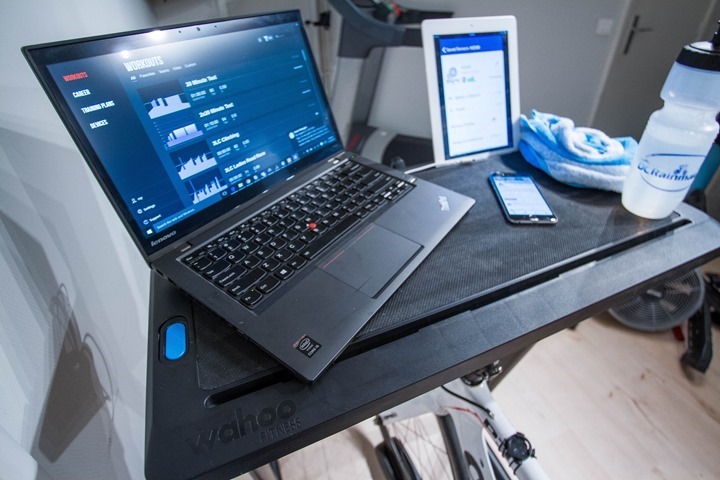 And thus, Wahoo’s back at it – with the Wahoo KICKR…Desk. Now, this desk shouldn’t be a surprise product. You’ll remember I showed a super-early prototype about 18 months ago, in this ‘behind the scenes’ post at the Wahoo HQ. It’s neat to see how much it’s evolved from that. Back in early November the company sent me out the KICKR desk to poke at for a while until announcement. Somewhat amusingly, it was delivered to the bar/restaurant next to the CupCakery (where we ship almost everything). While this occasionally occurs, this is definitely the most obtuse box to grace their dining room. The box doesn’t have a ton of parts, so this isn’t some sort of complex endeavor requiring your cycling buddies’ assist. The whole install only took a few minutes, so pretty quick and easy. It probably would have been quicker if I wasn’t trying to ensure I wasn’t getting in the way of the camera. The desk, as simple as it may appear at a glance, actually has quite a few features built into it. Let’s run through them. Though, there’s no lock on any of the three wheels, which I’ll talk about in the next section. Next up is that the table portion is non-slip, and has a gripping rubber surface. This ensures that a simple nudge won’t send your rose-gold iPhone 6s flying off onto your garage’s concrete floor. 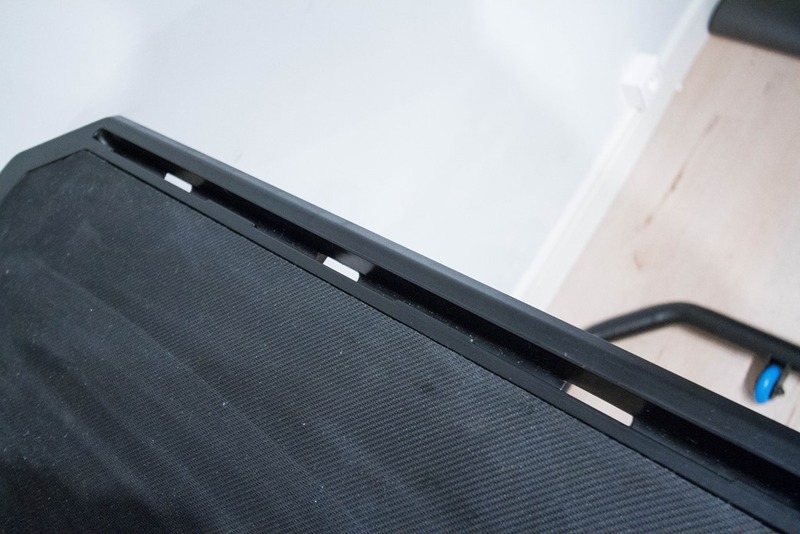 Along both the front and back edges of the desk are small channels. 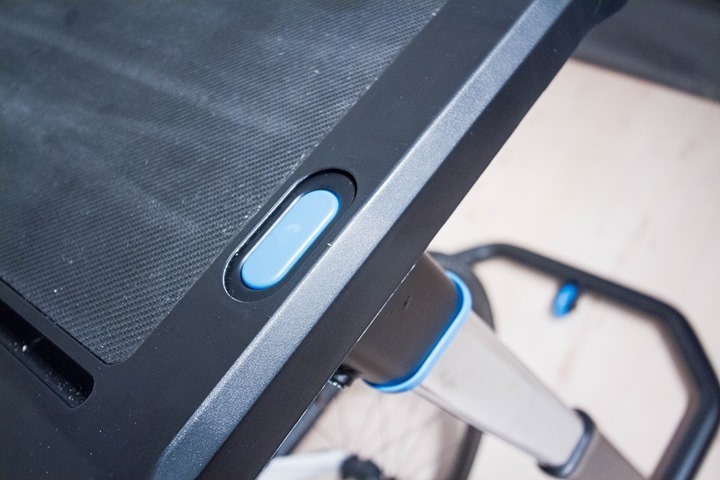 These channels allow you to slide a tablet or phone into the groove to keep it held upright. In addition, you’ll see small holes in the bottom of the grooves. This permits charging cables to pass through, allowing the tablet/phone/etc…to remain plugged into juice while in the tray. You can see one such charging cable running down below it. 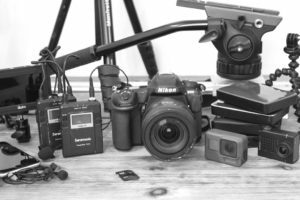 The channels also allow for cable organization too. Finally, the whole thing adjusts in height up/down using these two blue buttons (one on each side). The unit locks across a variety of heights every inch or so, from 33” to 48” high (84cm to 122cm). You can see that adjustment up/down in the video earlier on – it’s pretty thrilling. You can see that it easily clears my aerobars, which point upwards. Of course, in this configuration you wouldn’t ride in the bars. But you need only give it a light shove to push the desk forward of the bars. You could even lower it below the bars – making your laptop directly out in front of your head. I haven’t tested the total ‘load capacity’ of the table, though I wouldn’t be surprised if I could sit on it. The steel frame is pretty beastly (sorta like the KICKR itself). I wouldn’t want to use it repeatedly for any other body-weight bearing activities, but you’d be hard-pressed to put more on it than it could hold. Within the robust confines of my desk accuracy testing system, I have validated that the desk goes both up, and down. It’s able to do this repeatedly, and reliably. Further, all holes are usable. Additionally, the desk rolls forward and backward, also repeatedly. And sometimes too robustly. The only accuracy issues I’ve seen are due to my testing platform. Specifically, that the floors in my building – which were built some 230 years ago, aren’t flat. As a result, while testing the ability to zero-offset the desk, it will roll away by itself. Typically this results in a rider to desk collision, as the floors decline towards the rider in the DCR cave. 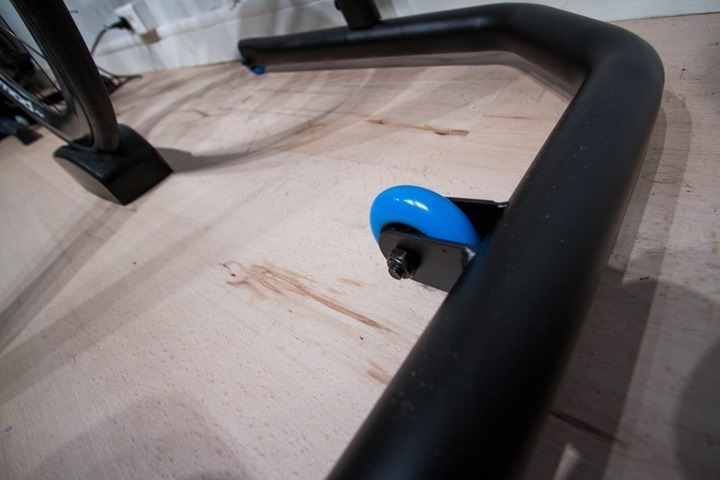 The cause of this unexpected rolling (aside from the non-level floors) is that the KICKR Desk includes surprisingly low-rolling resistance wheels. So it easily slides out of the way…or in this case, in the way. However, I have found that by placing any non-rolling object found on earth, in front of the wheels of the KICKR desk, that it won’t roll downhill. Examples of objects I’ve used are: Random single screw (Philips head), one USB charging cable (coiled), one water bottle (DCR branded), one small dog (until it moved), and a single 9V battery (used). Thus given the confines of the testing rig, I’m not seeing any accuracy issues with the KICKR Desk. Is the KICKR Desk compatible with a tandem bike? 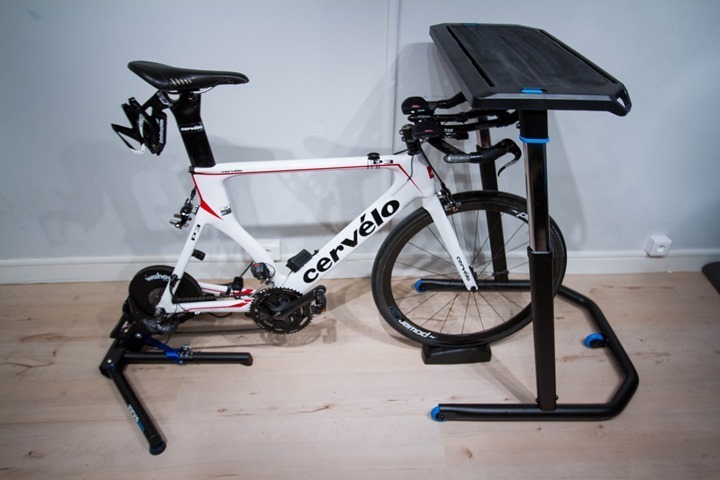 The KICKR desk would be supported for the first rider, however the second rider would be unable to utilize the desk – given the placement of the body of the first rider. Is the KICKR Desk compatible with the KICKR SNAP? Yes, it has KICKR in the title, right? 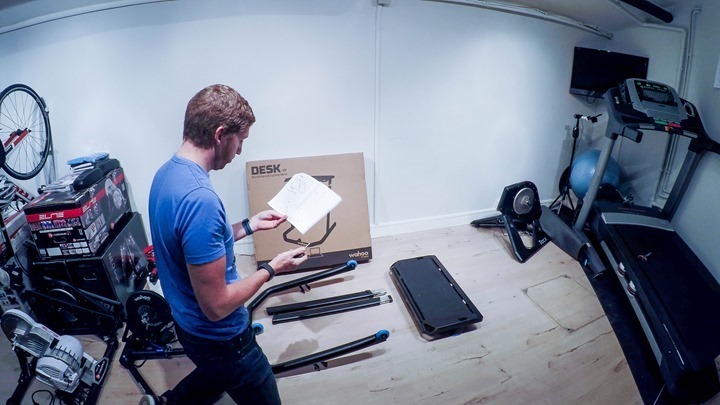 Is the KICKR Desk compatible with non-Wahoo trainers? 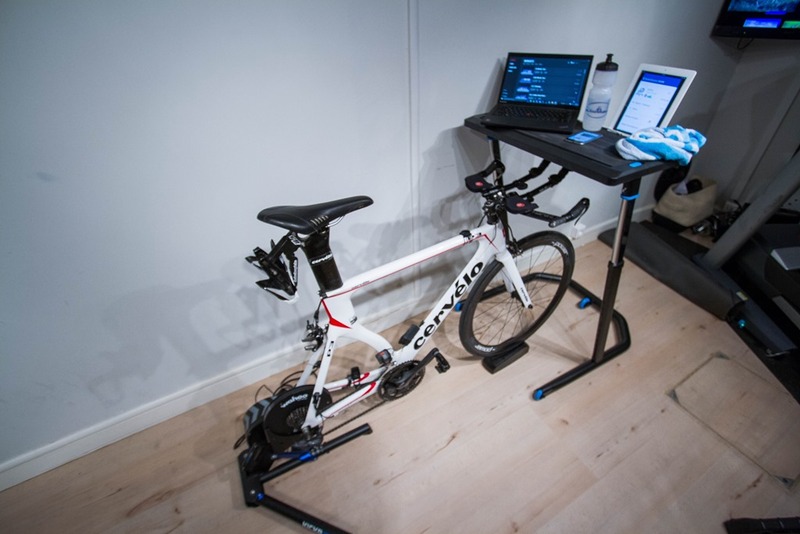 Assuming the trainer involves a bike, then yes, it’s compatible with it*. *Except as noted for secondary rear rider on a tandem bike. What is the price of the KICKR Desk? $229USD. Or approximately 229 gel packets. Shipping is free (zero gel packets). Is it available in Spain? No, Wahoo hates Spain – after all, Spain’s Movistar team bested Wahoo sponsored Team Sky in the Tour de France this year. As a result, no desk for you. However, Wahoo says that for now the KICKR Desk will only be available in the US while they sort through demand for other markets. Does the KICKR Desk work with bikes with aerobars? I assume you skipped the pictures in this review to read the riveting text, right? 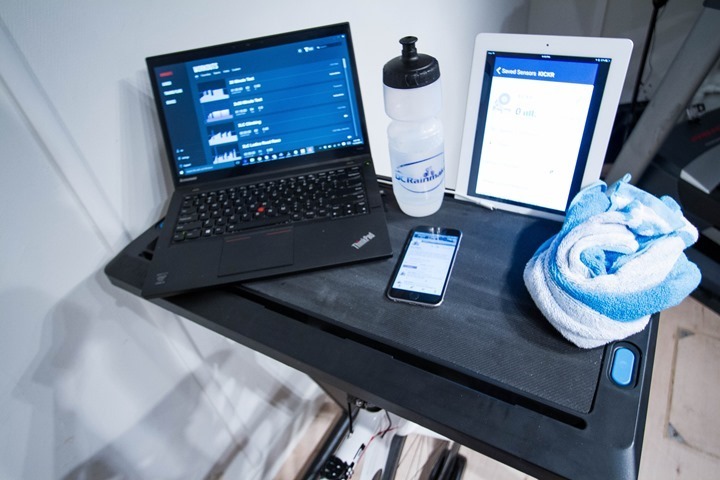 How many devices can the KICKR Desk hold? My current record is 9: 1xLaptop, 2xPhones (Android & iOS), 5xEdge bike computers (4xEdge 520, 1xEdge 810), 1xiPad. Plus one water bottle. I don’t believe I’ve reached the maximum allowable devices. Further architectural placement could result in increased devices per desk arrangement. How many water bottles can the KICKR Desk hold? The KICKR Desk table-top has dimensions of 28”x14”, or 392 sq. inches. The average water bottle has a footprint of 8.27 sq in. As a result, the unit should mathematically hold 47 water bottles in a non-staggered configuration. Note, if you have chubby water bottles, you’ll need to adjust your capacity estimates accordingly. You should also re-evaluate why you have chubby water bottles. It’s funny, over the many years I’ve been on trainers, I’ve never really found a great ‘desk’ solution for the trainer. Not that I needed a desk per se, but rather, I needed a solid holding system. In the past I’ve used a simple 4-cup OXO kitchen measuring cup, which clips beautifully on my aerobars to hold a remote control and my phone. But, that also wasn’t super-scalable. For example, it couldn’t hold a laptop or a tablet. All of which the KICKR Desk can hold. And – it does so really well. 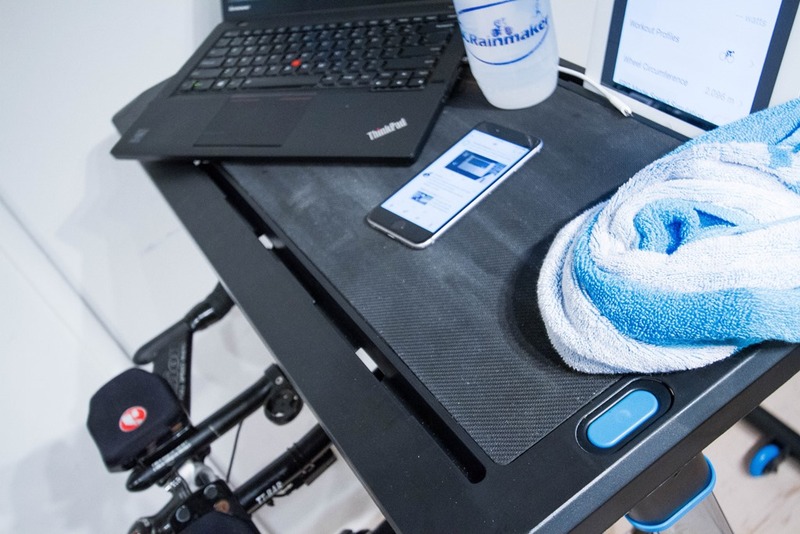 Heck, I’ve even started using the desk when I’m not riding the trainer and just working downstairs in the cave (my regular desk/office is upstairs). It makes for a perfect work station too. But, at the end of the day – it’s expensive. There’s no getting around that. It’s quite a bit more expensive than I expected it to be (or than more simplistic options for $50). In talking with Wahoo about that, part of the challenge is that it’s a low-volume item. And one that’s also a bit trickier to ship and store, being bulkier and more sturdy. Hopefully they’ll be able to see high-demand for the KICKR Desk, and get the price down. Because for me, the solution is so much more elegant and cleaner than the stack of random cardboard boxes that I often use. And I’m guessing – most folks are in a similar boat. I would love this but I definitely don’t see it being worth $230. Ray – we need some more info on that “desk accuracy testing system” of yours. 🙂 something coming from your desk-sitting life? Other than that it does seem a bit overpriced. even if solid metal tubing is used. Ray, thank you. I like the conversational way you write, the chubby water bottle comments were funny. 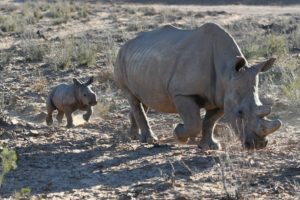 I am a busy mum and have to find quick solutions to challenges. I’ve been using my child’s spare music stand as a desk for my trainer workouts so I can exercise @ home. It’s made of sturdy black metal and has multiple metal clamps which screw tightly into placed 3-legs fold out (see OnStage Orchestral Music Stand, OSSM7211B @AUD$55). No grooves for caseless iDevices, though with fold-y, bendy cases they are fine. My monster Alienware 15 and 17″ Retina Pro have both sat great. Thanks again for the great job you do. Love it and would not have bought my amazing V800 without your work. Yup, pretty easily on the two side holes. And with a thin enough metal hanger, on the grooves too. Interesting product. I could see this being a decent little stand up desk. Wondering if the new hand crank ikea one would fit the bill for the trainer now too..
Just some personal thought. Isn’t it a bit dangerous to ride right next to heavy tools & blades with all the hardware in front of you while you are breaking a sweat? I am sure the shelf is pretty sold tho! I think I’ll stick with my 24.99 music stand. I use a Snap-on roll cart (part no. KRP1HD). Added benefits — lots of storage (see photos), polymer so can’t rust. Price is $265 from Snap-on on eBay from time-to-time. Looks great, but about three times as expensive as I (or I suspect anyone else) would pay. IMO it’s better than the Wahoo thing because it can’t rust and it has multiple uses. I store small bike parts in the top bin and all of my auto/bike cleaning/lube stuff is in the bottom tray. Its big enough and strong enough to put the 40″ tv on it if I wanted to. Yes, all Snap-on stuff is priced at the high end of reasonable. But this little cart will last forever and I can (and do) use it for other things when I’m cycling outside. 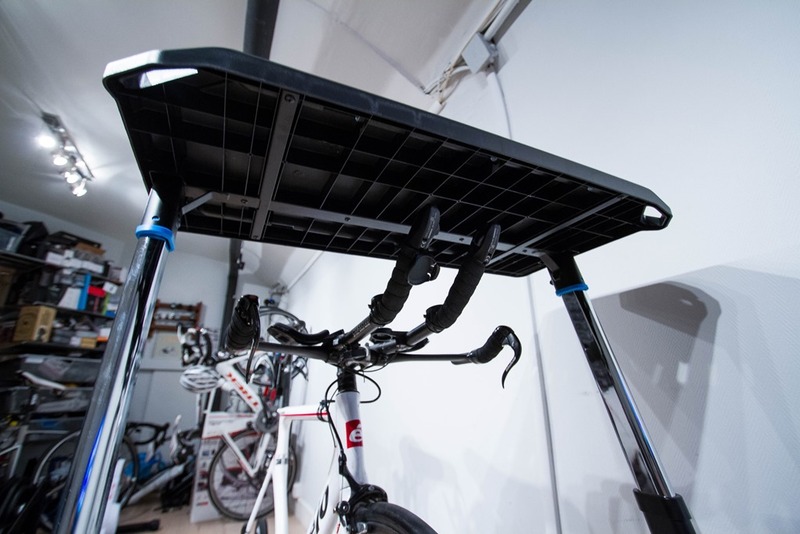 The fact that the top tray cover cantilevers out such that a bike wheel fits underneath, plus the locking wheels, makes it work fine for my purposes. Yes, it’s on the expensive side. But it will last forever and has other uses. 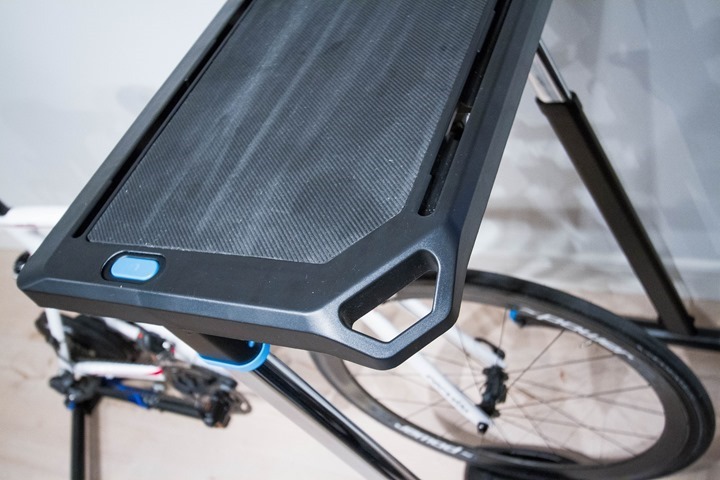 I think if I were going to get something like this I’d want it to be suitable for a treadmill as well as a bike trainer. And maybe also as an adjustable height sitting/standing desk. Ability to attach a sturdy monitor arm for my 30″ display would also be good. These uses aren’t contradictory are they? The holes in the grooves for tablets, are they big enough for the wahoo key to be plugged in whilst the tablet is mounted into the groove vertically? I’m not back at home at the moment, but I’m about 90% sure it was big enough. I’ll see if I can have a Wahoo person double-check. I’m still not 100% sure if this is actually for sale or if it’s an elaborate joke. Bonus points on the “zero offset” phrase usage. But the price isn’t terrible. Sure, it can be done for $50-100 as a DIY thing. My biggest problem is that a laptop on the “desk” would block my big fan. I have a small fan down low and a bigger fan that blows straight in front of me. I then put my laptop off to the slide (slightly). The head-on airflow is nice. I use an instrument tray as a “holding system”, but I don’t really use my laptop while I’m on the bike except to have Zwift on a screen. I just recently mounted a 32″ TV to the wall in front of the bike. This picture is of the room slightly incomplete, we just moved so I’m still making some minor adjustments but everything is pretty much in it’s final resting place. It’s a Jarvis Bamboo desk, about $700 bucks. Typical cost for most standing desks is around 1000 depending on features you want, this one is pretty basic and just has an electric motor with memory to store 4 positions. I am intrigued by the portability and the adjustability. Price-wise, about 150 might be right and could be close to enticing me. I really like that you can have it out front at a height good for in aero, or bring it close over the bars for using while sitting up completely. I use a 32″ TV set on the top shelf of a stereo component stand. Will Clever Training carry it? 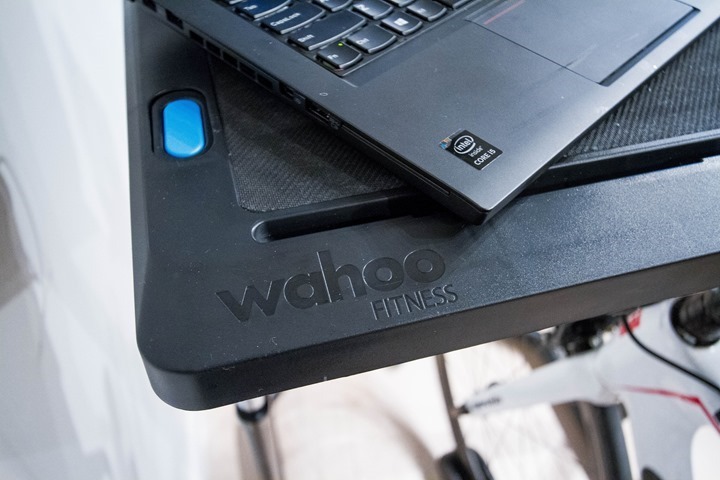 No, for now Wahoo is keeping the desk as a WahooFitness.com item. Though, that probably wouldn’t matter too much either way, since Clever Training doesn’t sell any Wahoo products. Yeah, that didn’t dawn on me until later. Gotta admit though that I was looking for a way to support DCR. Yes, it’s $229, but how much more for the small dog bundle? And is it compatible with Ant+ small dogs or only BTLE? I only work with dual ANT+/BLE dogs. Fantastic – and funny – review Ray. Thanks. I agree with others – $230 is pretty ‘spensive for a desk when lower tech solutions abound. That said, bravo to the Wahoo team – they have solved a lot of problems inherent in such cheaper solutions (moving it, stuff sliding, stuff needing to be propped up). Is this available in the UK? Can’t see it on the UK site: http://uk.wahoofitness.com ? Only in the US initially. Does it still work if you take it in a tunnel? It would be nice to see the table fold-able(top, bottom), integrated charging system, locking wheels, and tilting trays for the iphone/tablets. Wahoo keep adding features and people might opt for the $230 table instead of the cheap solution they are currently using. I use a $12 plastic shelf system from local hardware store that works perfectly. Are the holes big enough for both BLE and ANT+ signals to pass through at the same time? Maybe there’s a way to open them up more if not. It’s pretty…but I think that Wahoo really missed the boat on this one. There are so many other (cheaper) options on the market, that there’s no way this is going to be competitive. Not to mention all the homegrown stuff that we’ve all employed over the years. Sure, they’re not as pretty, but when I can build this out of scrap lumber or a $15 run to Home Depot/Lowes then a one trick pony $230 desk is a “I just won the lottery, what should I spend it on?” item. This post simply made me smile. Thank you! Thanks for the review! Was looking at it, but think the price is silly. 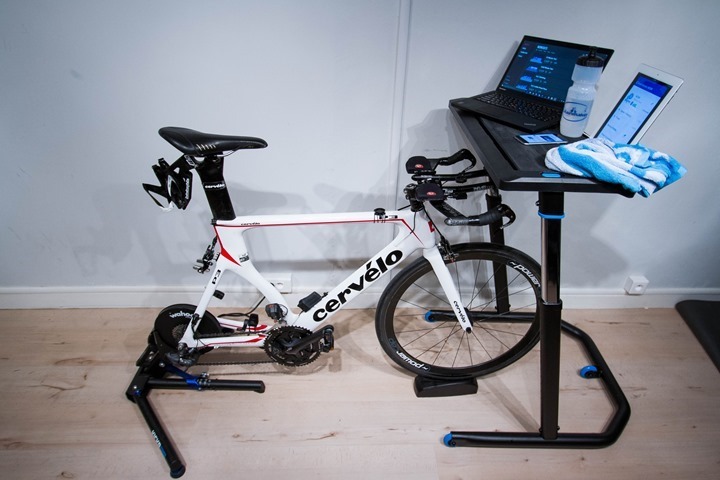 But, put a word into Wahoo that if this desk could also have an integrated front wheel quick release (ditch the wheels) I’d be game! Pah, call yourself a man? What’s with the reading of instructions? Next you’ll be saying that you used a map or worse still, asked for directions while out and about! 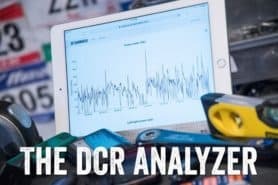 Wait…..is there a DCR branded water bottle??? Ray how do I buy this?? Please let give you mone! !! Thanks for posting what seems to be the best cheap alternative I’ve seen. Everyone has bashed the Wahoo desk but no one actually gave a cheaper reasonably useful adjustable alternative until you. I’ll be giving this a try for sure. It’s intriguing. Would you say it could be used as an ergonomic desk, ie standing and sitting? Along those lines does the back portion of the desk have a platform for a multi monitor clamp? You could rig a cage to hold a mid tower or small form factor pretty easily given the plastic fins underneath. I’ve used it for seating while at a bar stool type chair. And for standing too, both while in the cave just kinda moving it around. The only concern I’d have longer term is that unless you block the wheels it can roll a bit. Yep, it could use some c clip rubber feet as an accessory. 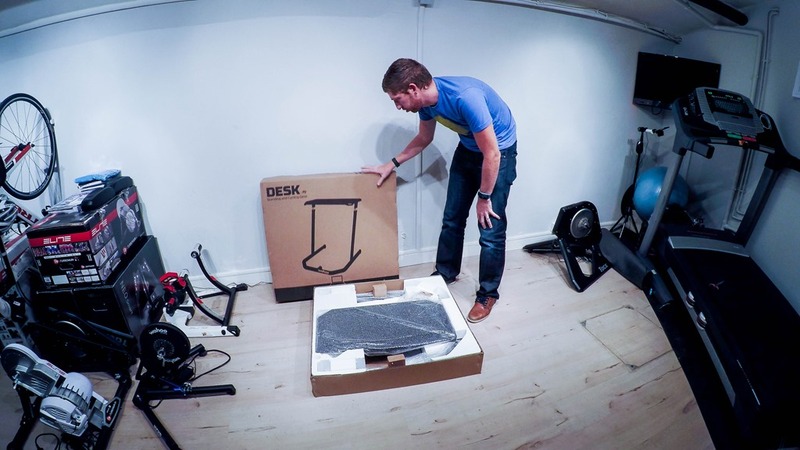 We could always see just how popular the table is by having a DCR-Wahoo Kickr Desk give-away. I’m game, anyone else in? Really, the pictures of the home DIYs justifies a need for an alternative, no offense. Shouldnt the towel loops be towards the front so they are easier to reach while riding. I just got the desk as part of the bundle. I think Ray misinterpreted the loops use. I think its for cable management. 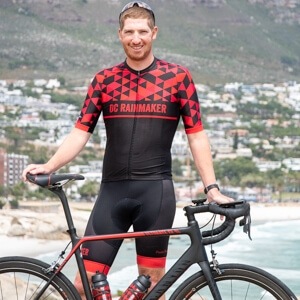 Once you pass a cable from one of the devices through the slanted slots in the desk, instead of it dangling straight down and getting in the way of your hoods or aerobars, you loop it up through the hook and down so it runs parallel to the extendable legs. But alas, it is real. Looks nice, but I opted for a music stand for a few less bucks. Works great, cheap, and works for now. I’m very disappointed if Wahoo don’t ship it to Spain. I was waiting anxiously to have two or three of them, but I understand that sponsorship has its inconveniences… May be someone in US can buy it and sent it to me? It seems that everything is coming earlier than it used to… Christmas begins in November… Easter eggs go on sale after Christmas… April Fools start in the New Year. You can buy a Hospital bed table for much cheaper… ok, it doesn’t have the look but. Have you tried this option for fit and reach? Thinking about ordering one to try it out. I clicked the link to your $50 variant. I couldn’t help but laugh at this and imagine you ringing the bell for “the girl” to bring you another bottle of fluid replacement. I’m surprised to see you using a wheel block with your kickr…isn’t it made to be used without? I just prefer a bit more lateral stability up there. You can go either way, Wahoo shows it both ways on their site. I’d get a Forerunner 920xt. I train with a Forerunner 220, Garmin Swim and Edge 500 but I only race with the Edge 500. I want more data from race day. haha, sorry Ray. That was meant for the giveaway thread :). 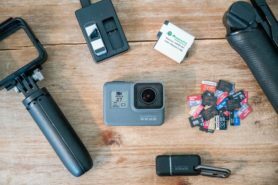 Go Pro Hero 4, so that I can begin documenting my crazy life and adventures wth some sweet photography! All of these comments have missed the #1 takeaway from this review. 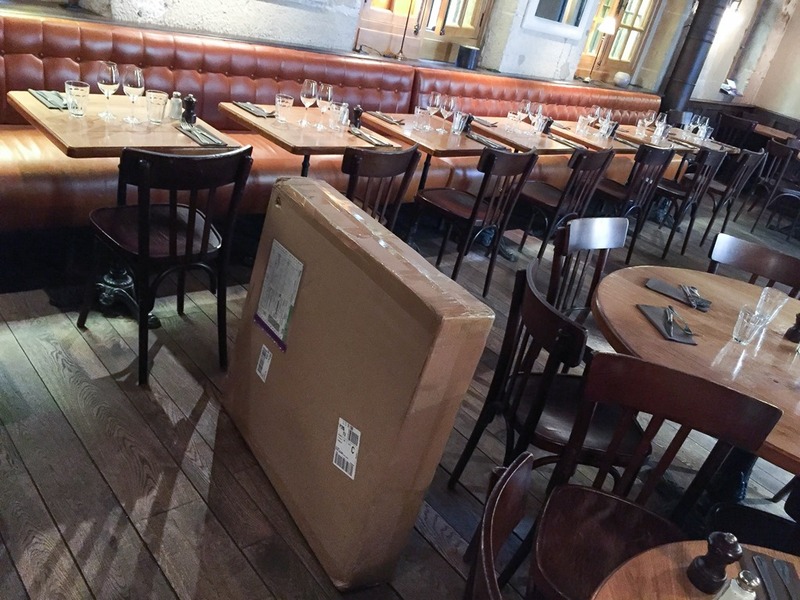 Why is everything shipped to the bar/restaurant next door? Wouldn’t you rather go to the bar to pickup your packages? Actually, all of our shipping goes to the CupCakery, since there are employees there 7 days a week from about 6AM till 7PM, so it makes FedEx easy. However, during the winter, we go down to 5 days a week. So on Monday and Tuesday we’re closed, and thus sometimes FedEx will retry – and sometimes they give it to the bar next door. And every once in a long while, they’ll deliver it to the Metro (subway) maintenance facility across the street. Did you happen to try using a mouse? I was trying to “un-minimize” zwift the other day using a wireless mouse on my side table and had a heck of a time. I do not know if yours positioning but from the pics I would imagine this would be very uncomfortable after 30 mins or so. i.e. 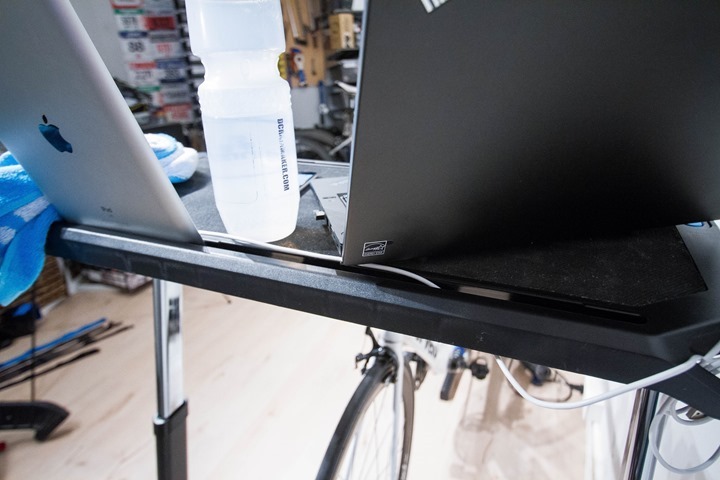 IMO desks do not lend themselves well to still putting all your weight up front like that for typing on a laptop, vs just cycling and having your hands on the top of the drops. Which is why I did this for 50 bucks :), yes it does not give you the same workout as a full on indoor cycling session. But, I do hours at a time on it in comfort and getting a basic low impact workout while stuck “behind a desk”. It has gone through a few versions since this first shot…. Yeah, I think the main reason for the desk is really more placement/holding than straight work. You’d have to bring up the height higher to make it work on a bike as high as might. That said, I’ve used the desk both as a stand-up desk, and just a regular desk (with bar stool) too for many hours without issues. Here’s my setup. It’s a music stand (shown with a surface pro 3 tablet). There’s enough room for my remote control and iPhone too. I found it brand new on ebay, for $15.99. It’s surprisingly stable. Much more stable than what I remember using as a kid in high school band. It’s also the conductor style so a bit bigger. It’s stable and adjustable enough that if I wanted to use a heavy laptop with it, I could just make it flat instead of upright, and tighten up the hinge. And, the height is adjustable. Before this, I tried two handle-bar style holders–one for the iPhone ($20) and one for the computer ($30). They sucked. I’m returning them. Agree with you. At least the bottle holders seem like a no-brainer, but I have to say, I am considering it anyway. It’s not cheap, but I to me the portability might be worth it – I’d use it for both work and working out. All that for ‘only’ $600 if you want the whole set 😉 I saw this product at a pre-race expo and loved it. Feels very sturdy and well made, but at this price it’s a no-go for me. It’s a good thing that Wahoo is getting into this in my opinion. Might drive some interest for such products and generate additional demand, which will drive prices down over time and hopefully generate some innovation. If you can mount a smartphone on your handlebars, there are remote control apps which can either be used as a mouse & keyboard. Some also have specialized layouts to handle various applications. You can sweat-proof by laying a piece of kitchen plastic wrap over the phone. It will still pick up your finger gestures through the plastic. Several years ago I tried using the Android app “Unified Remote” to shortcut various settings in PerfPRO. Ultimately it didn’t work because of how PerfPRO wrote the app on the Windows side as Unified Remote worked with everything else I tried (I wanted a remote control layout rather than mouse emulation). There are dozens of similar apps on Android and there must be a bunch on iOS as well. 1) It wasn’t $200+ Really Wahoo? What are you thinking? 2) If the towel holes were on the FRONT.. ?? My “Lifetime” table from Sam’s Club will do just fine for now. Larry: Great idea from the photos to zip tie the KICKR’s power brick to the support legs! I realise that I’m coming to this a long time after the event, but I just wanted to say I think that this is brilliant Larry. Far better designed and put together in my opinion than the Kickr version and reminiscent of the short of sh!t I try to make in my garage. You’ve inspired me to go and spend the afternoon knocking something together for my own personal pain cave. 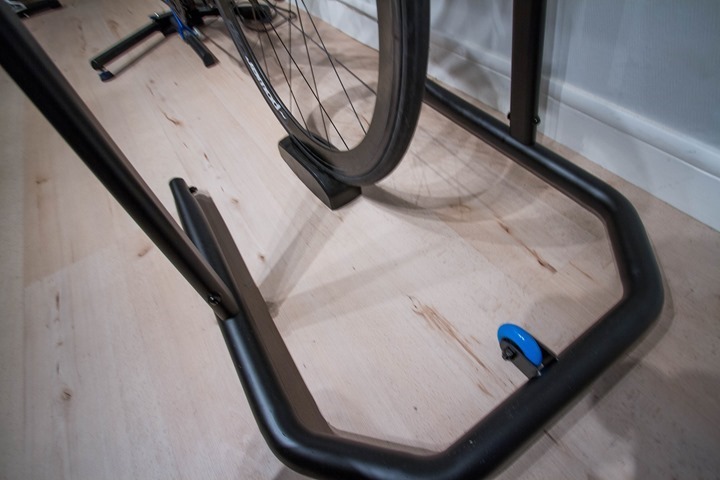 1) Does Wahoo’s official KICKR training mat fit inside the rolling legs? 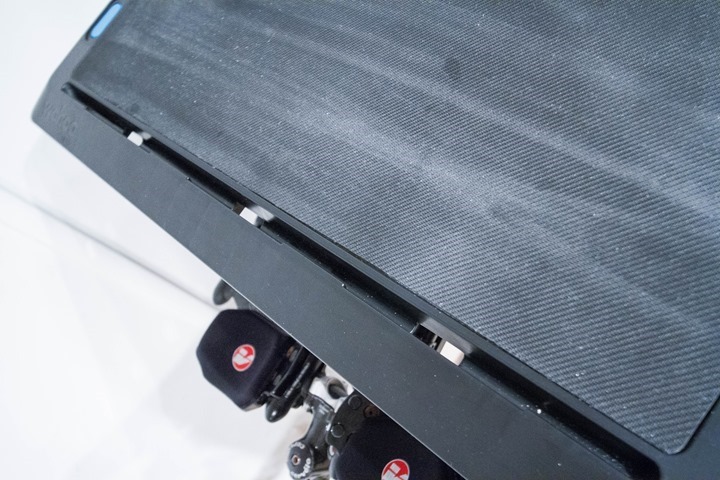 The height of a rubber mat would certainly challenge zero-offsetting and rolling action. 2) Interesting you use a front wheel pad with the KICKR. Does that raise the bike out of level? 3) Would the electronic device slots generally work with device cases? Or just basically wide enough for naked phones/tablets? 2) You can do it either way, it’s just something I’ve always done but doesn’t bother me much to use a slight increase. 3) No, generally not – it’s pretty slim. Ray: The Wahoo KICKR mat is 36″ wide. Does that help? Sorry- I wasn’t able to measure it before when I originally posted! All good then, just measured the desk and at the base it’s 71cm (28″) wide. Enjoy! 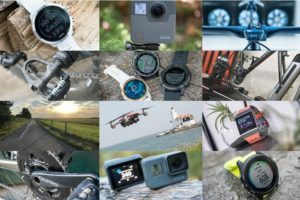 What’s its shipping weight – so I can figure out what the drop ship cost abroad would be? 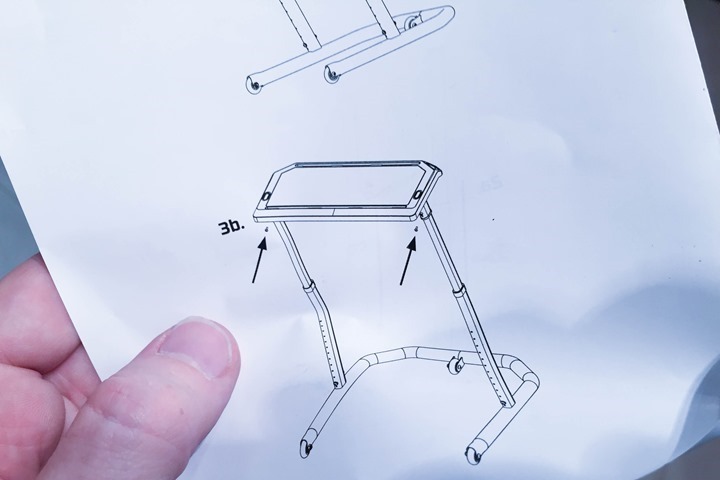 I had the same problem assembling the desk. On inspection found one of the plastic tabs on the plastic insert that fits in the right side of the desk top (where the right leg inserts) was misaligned. Popped it off with a screw driver and the leg then fit fit flush In the insert and the blue button popped into place. However, it would only still align properly only if the legs were inserted in the desk top before they were attached to the base. The whole thing is not very precisely manufactured and the the height adjustment “buttons” are a little short and do not hold very securely, so I’m a little concerned one of the legs might slip down under load. Once assembled, it works well. The concept and design are good, but I’d pay a little more for better quality fittings and sturdier construction. Take a flashlight and look into the bottom of the insertion point on the desk top. You will see there is a plastic insert wit 4 small plastic tabs. Those tabs are supposed to fit around the upper end of the leg below the blue button on the top of the leg. On mine the back tab on the right side was twisted and protruded into the opening where the top of the leg inserts. I broke that tab off with the tip of a screw driver and the leg went in and the blue button popped up. It seems just as tight and secure as the fitting on the other side. I imagine they can send you a replacement plastic insert, but in my case the “fix” I tried seemed an adequate solution. Recently bought the “pain cave” bundle from Wahoo which included the desk and mat along with the Kickr. It was only a $150 upcharge to get both desk and mat, so I felt it was worth it. Same here. VERY happy with the entire bundle. I use the desk as a standup desk for school work as well. You’d think Ikea or amazon would have a high/adjustable desk that fit this but I can’t find anything that looks right. You are funny …. I like that? Excellent product with only a hefty price premium for mere mortals after spending a ton on the Kickr Snap. I built one of these, cost me under £25 ($35). Upgrade for cable management as mine has 360 degree over-the-edge access for cables to drop over. If I had a router (the tool not internet portal) I’d make grooves to stand my iPad also!! Fixed height (but so are my bikes!) and eco friendly wood. Jobs a good’un. Great review again Ray. You mentioned that the desk could support some weight….do you think it would hold up a 40lb window air conditioner? It would be great as multi-purpose to support the ac against my tent window on hot-weather camping trips. 33″ high (lowest setting) would be perfect. Hey, does anybody know if the channel on the desk that accommodates smartphones would work with an ANT+ key plugged into the phone? I need an ANT+ key in my iPhone to link my ANT+ power meter to my Kickr. Thanks! You may want to update your page and add the link to Clever Training, since they are carrying it now. It is also on Amazon. Thanks for the heads up! Added links to both. Appreciate it! At what height are you using your Wahoo Desk, Ray? Are you using it at its max height, cca. 122cm or 48 inches? Thanks! Yup, at it’s tallest setting. Late to the party, just discovered this. Anyone know where you can get this in the EU??? All my normal bike(parts) pusher, does not carry it. Could not tell, how much room was between bars and stand. I have one of the Cycleops climbing blocks and was not sure if the bike would fit. Any ideas if you can use that block with this stand? While I love my desk overall, and have used it probably 100 times while training so far, the rubber top of the table is starting to degrade and do that sticky, breaking down rubber kind where it starts to turn almost gooey in places. Anyone else’s table having issues with rubber breakdown? Mine has not been exposed to anything harsher than the occasional splash of water from a cup. the wahoo adjustable stand is functional, but the price is, STILL in 2017, difficult to understand. the url is for a stand that is .3 the price and close to wahoo specs–must add the non-slip surface. Ended up with this ‘trainer desk’ for 27£ from Amazon UK. Cheap, sturdy and adjustable. Pretty much perfect. Anyway, found by searching “upgraded adjustable laptop desk”. How could you possibly use something that’s not purpose built and only costs a tenth of the cycling specific item ? It is lesser in size, features, quality and stability for sure, but still, for a tenth of the price. It keeps the monitor in front of my face and I can reach the mouse/drink/phone if needed. To each his own. One caution is not to torque the hell out of the screws connecting the upright legs to the base at first…..get the top on and screws started ….if it can “float” a little that will make it easier to line stuff up……I cranked on them first and the index pin in one leg wouldn’t line up……or hold firm if with the top on…. after backtracking and loosening, it all worked smoothly. It’s very solid. that looks super! I’d put the extra bottles on the shelf, and it fits your front wheel block perfectly too! Great meeting you at Interbike this year. 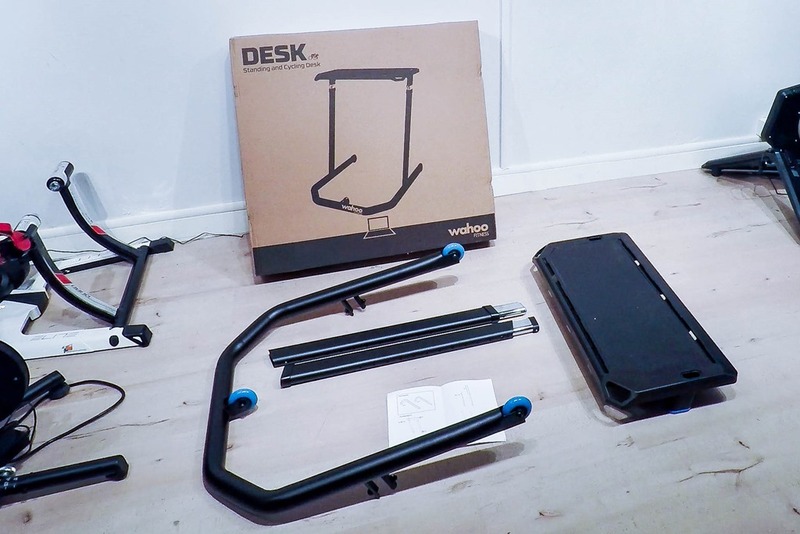 I picked up one of the Wahoo Bike desks and really enjoy it. I did think it was sort of a pain to put together. Mine for whatever reason required me to use a rubber mallet before it would slide in properly. If you are using the KICKR Climb you will have to obviously push the desk forward out of the way, but so far the desk does what it was designed to do. Wow…man, that’s taking knock-off to a whole new level. Though ironically they did at least fix my main two gripes: A) Lack if water bottle stability, B) Lack of way to lock the wheels. or Backcountry apply their 20% discount. Think I may order this one. From what one guy from a bike shop said, Wahoo only allows one sale a year on their products. Well, in the US where those restrictions are legal. I thought the REI 20% off a full priced item would apply, but it didn’t so got this one. I’m using over bed table – which are used in retirement homes and hospitals. Less than 1/3 of the Wahoo price. I want to share my pain cave desk very functional to have on hand all your Integrated your essentials while riding is available on ebay. Neat stuff. Note that I don’t normally allow spamish commercial comments/ads (on any posts by anybody). However, this is interesting enough that I’ve consolidated the gist your multiple comments into this singular one here. I have found abetter solution for wahoo desk. You can see my pain cave setup using this desk. It is really good and worth every penny ! I’m looking to grab this to actually do work on while riding (I work from home). What are your thoughts on being able to sit upright enough to send and reply to emails off and on over a 3-4 hour period? Can it get close enough to have access to typing on a remote keyboard while still providing enough space underneath to access handlebars / shifters? Think it would hold the upper body weight as well, if I wanted to rest on it or hold onto the sides?